This was an excellent house for our first visit to Kyoto. It is clean, comfortable and beautifully presented with all the necessary facilities. The area is quiet and about 20 minutes walk from the main station in Kyoto, and 5 minutes from Tofukuji station. There are several nice restaurants near Tofukuji and a beautiful shrine with lovely gardens 10 minutes walk away. Many thanks to Nishimura San for making such a pleasant house available for us. Our family of 5 had an excellent stay at Tara house. It is very well located and provides rapid access to many sights in and around Kyoto. It is extremely close to Tofukuji station and the Tofukuji shrine and also the very well worth visiting Inari temple with thousands of arches and a great hike. If you like running or biking it is also right next to the trail on the Kamo river. You can get trains form Tofukuji station or it is a 15minute walk to Kyoto station and all of the trains and buses that stop there. The house is well equipped for basic cooking and there are several small supermarkets near by with some larger ones just up the road past the hospital. The accommodation is compact but not cramped. It is clean and very well maintained. The owner- Kazuya- was very easy to contact and helpful with what to do and see, and any questions we had. He also sent us some items that we had forgotten. All in all an excellent stay and we would definitely stay here again. We really enjoyed our recent stay at Tara House. The email directions from the train station were easy to follow and the gracious host met us at the property to orient us to the place. We used the washer/dryer, refrigerator, microwave and cooktop. We appreciated the heated flooring, nearby amazing burger restaurant and 5-10 minute walk to the train station and Family Mart. It was on a quiet residential street and there was a grocery store within walking distance. I made a mistake and thought we had booked the place one more night and the host was let us stay one night at the house right next door. We were very thankful for his help and compassion! We would highly recommend a stay at Tara House. Cannot say enough lovely things about this house! Great quiet location, yet only a few minutes walk to the station and then one stop into the heart of Kyoto or three stops to Gion. Very handy. If you're a jogger, the river path runs right at the end of the street. Had no trouble finding it from the excellent directions given. Supermarket close by. House itself was spacious and clean. Bedding clean. Kitchen huge with everything you need. Bedrooms upstairs which was great for our four kids. Rooms all warm. Bathroom spotless. Excess towels. Would recommend this house in a heartbeat! Great instructions left and we felt very welcomed. We are a family of 5, so our biggest challenge was finding a centrally located place to stay in Kyoto that could accommodate us all comfortably. Our host, Kazuya's apartment ticked all the boxes in what we were seeking. It isn't a very large apartment, but it was spacious enough with the soda bed downstairs and the very modern and intelligently designed kitchen and bathroom which made it very comfortable. We were close to the station which was 1 stop away from the central station, so getting to all the sights was easy. The Tara house was awesome! 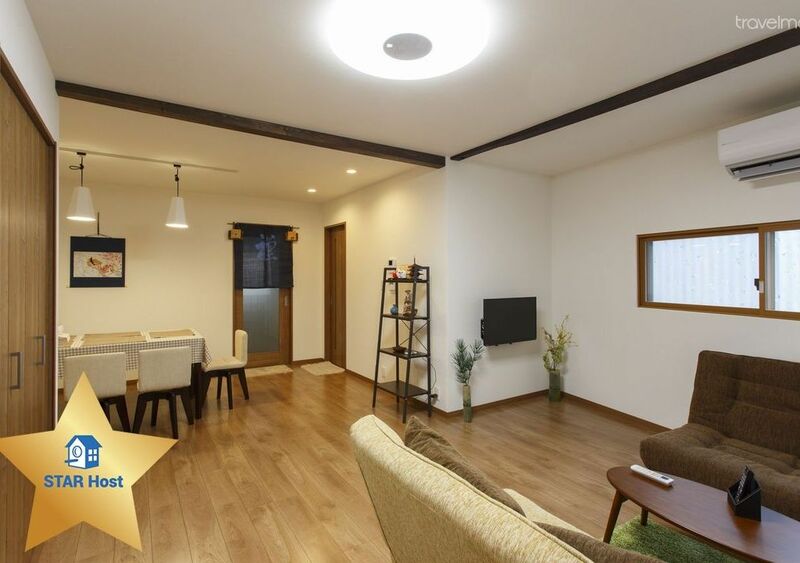 It's less than 2 years old and is a spacious property in Japanese standards. There are two bedrooms with Western beds that are very comfortable and a traditional tatami room if you want to go the futon route. The owner is easily accessible if you need him. It is a located a short walk from the station and a convenience store. There aren't a ton of places to eat right around there and some information on that would be helpful. Such a great stay! !